This year, for the first time in eight years, I cried because of my work. As many times before, I was called in to restrain a student whose physical tantrum, prompted by a family issue, threatened his own safety and the safety of others. His lone teacher was overwhelmed, with no co-teacher to support, because it was deemed too expensive. We no longer had the mental-health staff on site to support him in crisis, because it was not financially sustainable. The parent coordinator who could have intervened had to be laid off. He was only 5 years old. In his rage, he seemed as strong as a 20-year-old. With all my might I hugged him in a safety hold so he would stop punching the wall, hitting his head on the floor, and throwing furniture. 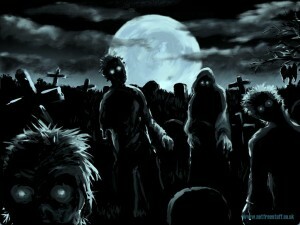 After some time he calmed and a crisis team arrived. I released him and returned to my office and sobbed. As a result of these circumstances, our young scholars have tremendous emotional, academic, and social needs that challenge our mission to develop in each of them the character, scholarship, and leadership necessary for success in college, community, and life. Anticipating this, we initially envisioned a classroom model that would put two full-time certified teachers in each classroom to enable more personalized instruction. As enrollment grew over time, we planned to provide a comprehensive education including deep learning in the arts and Spanish. We sought partnerships with mental health providers to provide onsite psychiatric and counseling services so that students could overcome trauma and be ready to learn. We hired a full-time parent and community coordinator to partner with families to support their children in achieving excellence. When I started in the 2008-2009 school year, this all seemed possible. Our government funding at the time from both federal and state sources amounted to $17,588 per pupil. Based on recently released state school aid figures, we expect to receive $16,015 per pupil for next school year. This difference in real per-pupil aid leaves us $1.3 million short of anticipated funding if government aid had kept up with inflation. I don't doubt Simmonds' sincerity here for second -- but this argument most certainly needs some scrutiny. First of all, as I have reported multiple times, charter schools have been "held harmless" in their funding over the past couple of years, thanks to the Christie administration's policies. This has hit Newark Public Schools particularly hard, as they've had to transfer more and more money over to charters even as their own aid per pupil shrinks. Second, while University Heights CS does have a large population of students in economic disadvantage, they are by no means enrolling the highest percentage of free lunch-eligible students in the city. UHCS is right at the media for FL percentage; good for them. They're clearly serving more students in disadvantage than "successful" charters like Robert Treat or North Star. But what about all those public schools that are serving even more FL students than UHCS? Don't they need resources too? Don't they need support? If so, why have they not been "held harmless" in their funding like the Newark charter sector's schools? This year, Christie has promised to help make up the "held harmless" penalty for NPS by giving more state aid to the district. The catch is that aid must pass through to the charters; NPS can't touch it. How can anyone say this is fair -- especially when so many charters (not all, but many) aren't pulling their weight in educating children in economic disadvantage? Here are the classification rates -- the percentages of children who have been identified with a special education need -- at NPS and all of the charters in Newark. 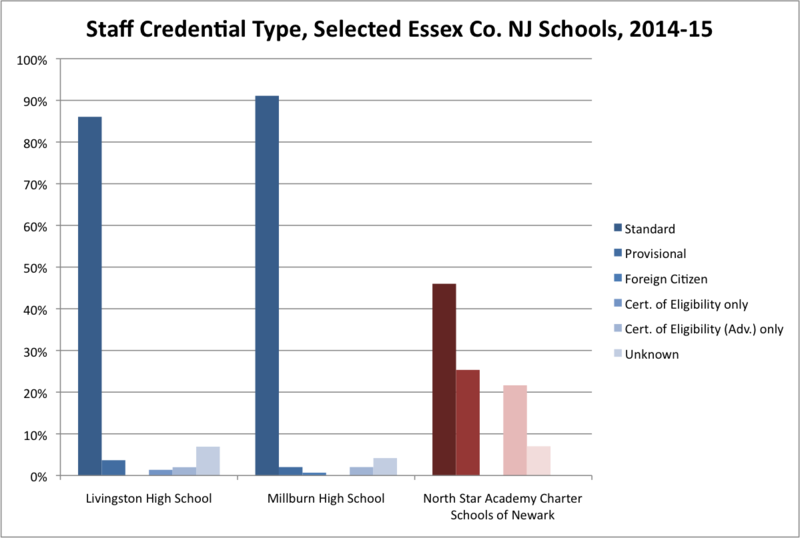 In New Jersey, charters are essentially their own districts, so the comparison here is warranted. 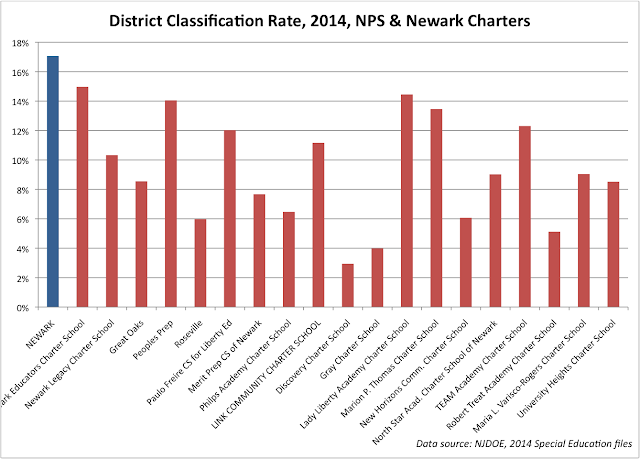 No charter school in Newark serves as large a proportion of special education students as the Newark Public Schools. NPS's classification rate is 17.1 percent; UHCS's is 8.5 percent. I can certainly sympathize with Simmonds' plight here, but isn't the problem even greater at NPS? Now, there is a caveat here: charters do get money from their host district based on the number of children enrolled with a special education need. A charter that enrolls a smaller proportion of special education students gets less per pupil than a charter that enrolls a greater proportion. But the issue is actually even more complex than that, because not all children have the same special education need -- and the costs can vary significantly. According to the state's own consultants, Specific Learning Disabilities (SLD) and Speech/Language Impairments (SPL) are "low" cost disabilities compared to more expensive ones such as autism, emotional disturbance, traumatic brain injury, visual impairments, and so on. We know that charters enroll fewer special education students overall; but what sort of disabilities do special education charter students have? 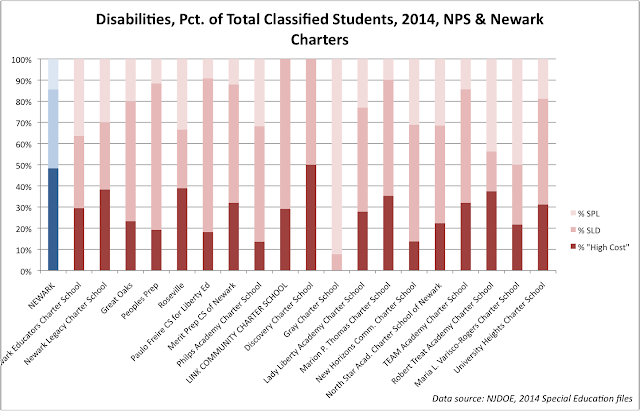 What I'm showing here are the breakdowns by disability for NPS and the Newark charters of the entire population of special needs students; that's why all charter and NPS percentages add up to 100. 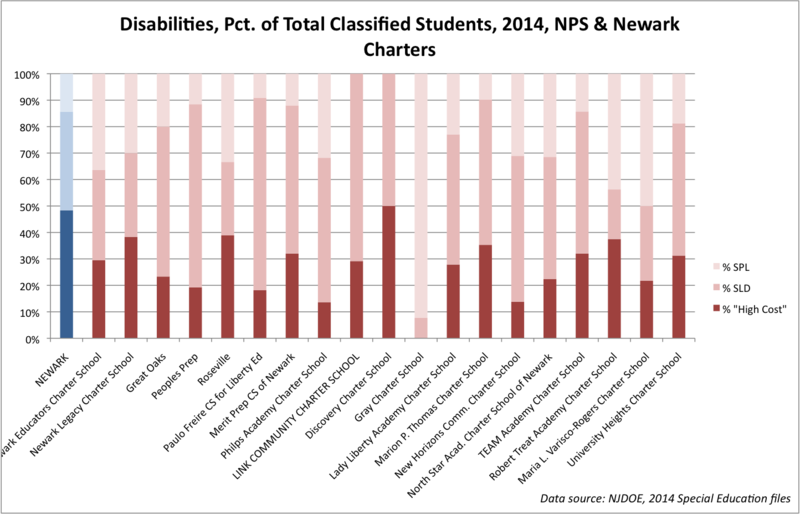 NPS's special education population has proportionally more students with "high cost" disabilities than the charter schools. If you look at a charter's aid notice, you'll see that special education students are sorted out by speech or non-speech; that's it. Given NPS's high classification rate of "high cost" disabilities, there's plenty of reason to believe the Newark school district is taking a major fiscal hit because it educates a greater proportion of students with the most profound special education needs compared to the charters. And yes, there is extraordinary special education aid available from the state (scroll down), but it doesn't come anywhere close to covering the local share of costs for high-needs students. 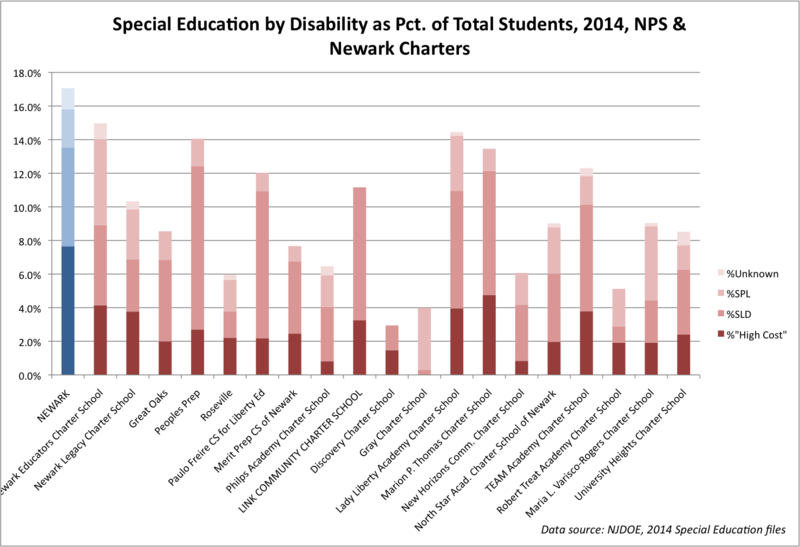 1) NPS educates a greater proportion of special needs students than the Newark charter sector. 2) NPS educates a greater proportion of "high cost" special needs students than the Newark charter sector. And yet, because of the "held harmless" provisions, and because of the way special education aid is distributed to the charters, NPS is bearing an even greater fiscal burden. As we are faced with this reality of limited resources, it is imperative that all schools -- traditional, charter, magnet, and private alike -- work together to come up with innovative ways to serve our most at-risk students and continue to share best practices throughout the state. Collaboration, not combativeness, is what will help ensure all children have the resources they need to thrive. I'm sorry, but that is very, very difficult to swallow. "Best practices" should include putting resources where they are needed -- it's very hard to make the case that this is what's happening right now in Newark. Simmonds is absolutely right when he says that children in economic disadvantage and who have special education needs deserve more money so they can get more services. But if resources are really that scarce, how does it make any sense to create a system of redundant school governance in the name of "choice"? Wouldn't a better "best practice" be to start consolidating a system that currently replicates administration at the cost of getting more resources to the children who need it the most? If we're going to "work together," let's start by asking this basic question. These guys are wicked smart - they even wrote their own software to make these. Buy their DVDs -- they deserve support. As I've shown, this claim is factually correct, but it masks a larger truth. The pass rate on the PARCC was no doubt affected by the high opt-out rates in suburban schools. Those students almost certainly knew the PARCC didn't mean diddly to their futures, so they blew it off. Remember: Uncommon is the former charter management organization (CMO) of our new Secretary of Education, John King. Even though the USDOE frowns upon suspension as a practice, Uncommon's schools in three different states have high suspension rates. Is this one of the "systems and strategies" Chiger credits for Uncommon's success? Chiger notes that Uncommon's leaders have published plenty of books describing the "systems and strategies" they employ. One of his links is to Doug Lemov's Teach Like a Champion, 2.0. Lemov is the "Managing Director of Uncommon Schools’ Teach Like a Champion team" (whatever that means). Dude, seriously? You're writing this in 2010 -- please tell me you don't actually think you're saying something innovative. Teachers have been warned about only calling on kids who raise their hands for years. OK, sometimes it's good to be reminded of things that reek of common sense... but is this really one of the "systems and strategies" that sets Uncommon apart from other schools? Other teacher training leftovers presented like nouvelle cuisine include "wait time," making students do things over and over again until they get it right, and framing things positively. There's really nothing innovative or unique in all this; it's all stuff I saw when I was a novice teacher going through my traditional, university-based training. Understand, it was only a small part of that training; developing a comprehensive teaching philosophy takes time, a variety of coursework, and intensive scrutiny of a developing teacher's practice. Let's knock down the straw literary critic first: no one I know has ever said that students of color should only read books by authors who share their backgrounds. Of course black kids should read Tolstoy and Euripides -- just like white kids should read Ellison. I'm old enough to remember the debate over The Closing of the American Mind in real time. What critics of the "Great Books" curriculum were actually saying was that if the canon only includes white guys**, a lot of great work is going to be excluded, and students are going to rightly wonder why -- especially students whose own backgrounds are not represented. Is this really such a critical place for Lemov to plant his flag? Would he really be so put out if a school taught Ellison and Baldwin and Morrison and Hughes as its base, with a bit of Milton and Melville added to mix things up? Would students' critical facilities really suffer under that sort of a curriculum? This offers a reminder not to assume there’s a “they” who won’t really “get” something, say sonnets and other traditional forms of poetry, and that it’s therefore better to teach them poetry through hip-hop lyrics instead. What happens when they take Introduction to Literature in their freshman year in college and have never read a poem written before 1900? Kids respond to challenges; they require pandering only if people pander to them. Again: no one is saying that all students shouldn't read poems by white guys written before 1900. But what happens when students go to Harvard and major in English and find they are expected to take core courses like Migrations: Fictions of America but have only read white, male novelists? It seems to me that the world has passed Doug Lemov by. The tired debates about "multiculturalism" have become pointless, because the canon has changed, and largely for the better. Why does he feel the need, then, to bring all this up? What's the mindset here? If there was ever a "teacher-centered pedagogy," it's Teach Like a Champion. In Lemov's world, the teacher is a technocrat, gathering up a bunch of tricks and tips so she can fill up her students' heads with the stuff that gets them to pass PARCC tests. Individualizing instruction isn't a concern of a "champion" teacher; to the contrary, Lemov believes that teachers should be "strategically impersonal." There's little in the book about making personal connections to students. There's little about project-based learning, or other forms of constructivist instruction. There's little about building a learning community, or fostering an environment of healthy debate and respectful dissent. 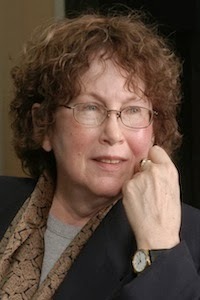 I've been posting Jean Anyon's picture at the end of this series all week to make a point: the pedagogy that Lemov espouses would never, ever fly in affluent suburban schools. Anyon's classic 1980 study made the compelling case that schools structure their curricula and cultures around societal expectations based on class and race. Experienced teachers with university-based training. A broad, rich curriculum with many opportunities for college-level courses. Student-centered learning (at least as a goal). A literary canon that largely reflects students' backgrounds. Shorter class days, but many opportunities for extracurricular activities. Access to cultural, economic, and social capital that aids in preparing students to be accepted into and thrive at elite colleges. Inexperienced teachers with "alternative" training. A less broad curriculum, focused on standardized test outcomes, with fewer college-level opportunities. Teacher-centered learning (at least as reflected in their training). A literary canon that largely reflects other students' backgrounds. Longer class days, and fewer extracurricular, artistic, foreign language and other offerings. High suspension rates, part of a strict disciplinary environment. Less access to that same capital -- in many cases, far less. Do I blame Uncommon and Doug Lemov and Stephen Chiger for this last reality? Absolutely not: I do blame them, however, from distracting us from having the conversation we should be having. There is a fundamental, structural difference between the lives and the schooling of disadvantaged urban and affluent suburban students. This difference will not be rectified by "choice," nor by a "no excuses" pedagogy; it can only be addressed by making education "reform" part of a larger program of societal reform. Do I think our schools can improve absent a renewed assault on poverty and inequity and racism? Unquestionably, yes -- starting with a policy of adequately and equitably funding our schools. In New Jersey, fully funding the state's own law when it comes to providing state aid would be a good start (but it would only be a start - more to come). And if we are going to have "choice," we'd better make sure it isn't negatively affecting the finances of public, district schools, as it too often does. And let's be clear about something else: we have far too many incidents, both large and small, of teachers and administrators behaving badly toward students of color and students in economic disadvantage in public, district schools. *** This is a serious problem, and it can't be simply be dismissed by pointing fingers at "no excuses" charters. But these conversations keep getting delayed by the promises of "reformers" who sell stories about their beloved charters "...giving lie to the implication that school improvement needs to wait for the country to heal poverty." It is clear to me that these schools are demonstrating exactly the opposite: despite all their "successes," high-flying charter schools continue to show that "choice" and "reform" will not overcome the structural inequities inherent in our education system. It is time to move beyond the reform industry's focus on "choice" and start having an honest conversation about the state of America' schools. I understand Chiger and Lemov's desire to justify their work, but a-contextual data points in the service of promoting the myth of the heroic charter school are little more than distractions. We can do better. * I swear, it's a word. *** And LGTBQ students, something I haven't written nearly enough about. I will try to get to that more this year. Rock star Keith Emerson killed himself because he feared he was no longer good enough as a musician, his girlfriend exclusively told The Mail on Sunday last night. The 71-year-old founder and keyboard player of Emerson, Lake and Palmer was 'tormented with worry' about upcoming concerts in Japan because nerve damage to a hand had affected his playing, said Mari Kawaguchi. She found Emerson's body when she returned to the apartment the couple shared in Santa Monica, Los Angeles, early on Friday morning. He had shot himself with a gun he kept for protection. As a music teacher, this hits me in the gut so hard I nearly can't stand it. First: lord knows I've been there. You almost never play as well as you think you could have, and it's very easy to get into a mindset where that doubt eats you up and spits you out. Some performers find that place where they are so supremely confident that they revel in their imperfections. Most of us, I believe, do not. Next: it was well know for some time that Emerson had issues with nerve damage (I had heard that it was Carpal Tunnel Syndrome, but who knows). You have to understand this guy was a technical monster at his instrument. There was a part of his career where he was considered the Jimi Hendrix of the organ. I can't tell you how many hours I played that ostinato in my left hand while trying to improvise in my right when I was in my mid-teens. Was it the most tasteful playing? I hadn't met Bill Evans or Thelonious Monk yet (two more technical geniuses -- only pianists get that, maybe), so these days, I'd say no. I'll confess I haven't pulled out an ELP album in some time. But this music meant the world to me back in the day, and I know I'm not alone. It obviously shattered Emerson to think he wasn't going to be capable of playing this way anymore. Music should be a joy, but like so many things in life, it can bring pain to those who love it the most. I only hope that Keith Emerson is finally at peace, and I am glad that his music is here for those of us who still cherish it. Again: I think this reflects the structural advantages of affluence far more than school quality. But this is why I find Chiger's argument so pernicious: he is making a clear implication that "choice" is going to overcome the effects of economic disadvantage on schooling outcomes when that's just not the case. Chiger, to be fair, is not alone. 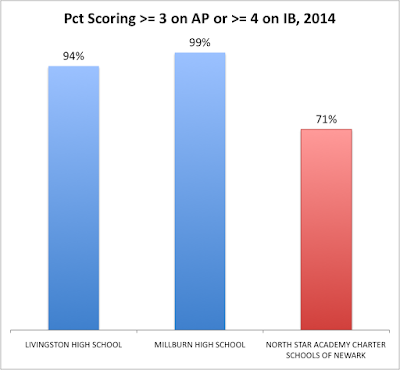 TEAM/KIPP schools fed taking points to The Star-Ledger that their schools "beat" a suburban school district, even though the one score they cited was clearly an outlier. Eva Moskowitz has proudly compared the test scores of her students to the affluent 'burbs of New York, neglecting to mention those scores did nothing to help her students gain admission to the most elite NYC high schools. The instructional day is much longer at North Star... but this is a bit misleading. Because when the final bell rings at Livingston or Millburn High, the day is far from over for students. Many go to sports practice, or clubs, or music lessons, or tutoring, or community service, or a variety of other activities, both in and out of school, designed to pad their college resumes and help build their social and cultural capital. 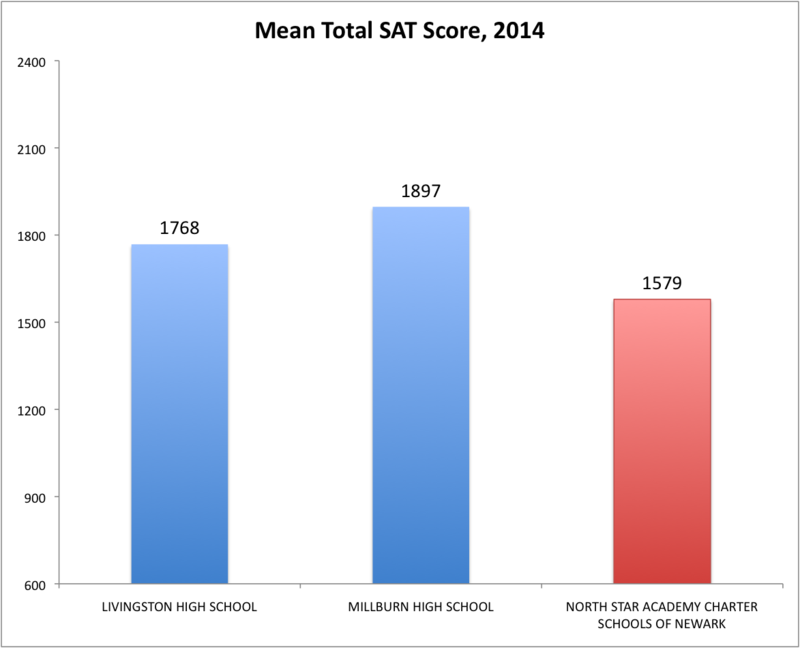 Again, we need to approach this with a bit of caution: Millburn and Livingston are high schools, while North Star is a K-12 school. But I still find this instructive. 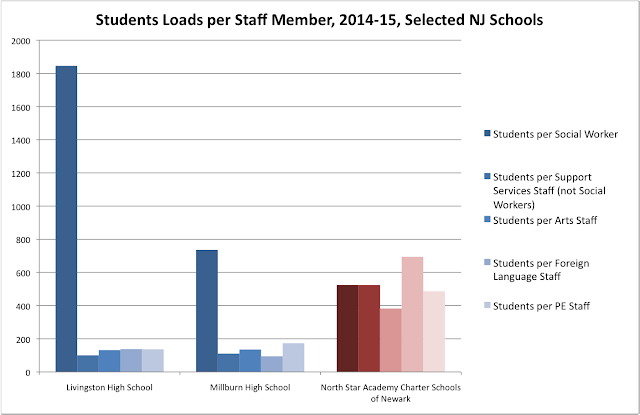 "Student loads" are the number of students per staff member for different job assignments; a lower student load means more staff per students are assigned to a particular job. What do we see here? 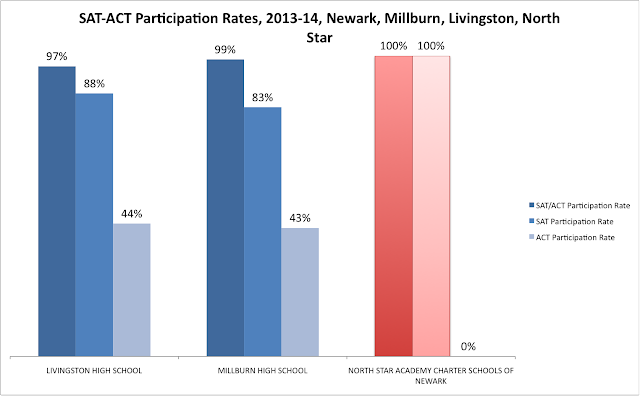 North Star has many more social workers per student than Livingston or Millburn. This is no surprise, nor is it a poor decision on North Star's part: their students are much more likely to be in economic disadvantage, so it makes sense that more staff would work with the students and families to overcome these disadvantages. This is a good thing -- but there is a price to be paid. Because affluent high schools don't have to deploy staff to deal with issues of economic disadvantage, they can offer learning opportunities and other supports that even the most "successful" urban charter schools can't. Livingston and Millburn have many more foreign language staff, arts staff, PE staff, librarians, school counselors, and other types of staff than North Star could possibly offer their students. This is a structural advantage that will not be overcome by choice. In fact, there's a very good argument that "choice" makes the situation worse because redundant systems of school governance are inefficient -- they replicate administrative and other costs rather than putting resources into student instruction and support. 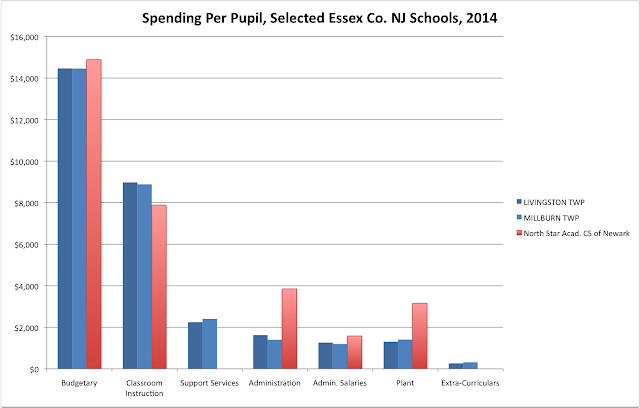 From the NJDOE's Taxpayers' Guide to Education Spending. "Budgetary Per Pupil Spending" is a metric that allows for comparison between districts while acknowledging that different districts have different fixed costs. It's hardly a perfect measure, but it is interesting that North Star's BPP figure is slightly higher than Millburn's or Livingston. Where the money is spent, however, is far more telling. 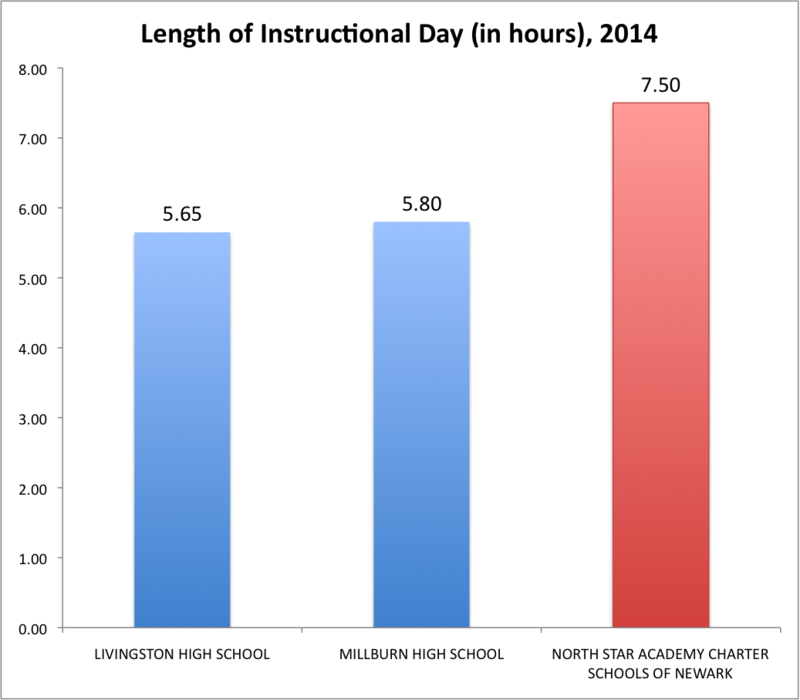 North Star spends less on classroom instruction than the suburban schools. The Support Services figure for North Star is clearly faulty... but even if North Star has moved that budget line into Administration, it doesn't explain why their Plant costs are so high, or why they spend nothing on Extra-Curriculars. How might North Star bring down its instructional costs? Start by hiring a staff that has fewer standard certificates, and more provisional ones. A certificate of eligibility is for a new teacher who hasn't completed formal training. More than half of North Star's staff is provisional or holds a CE. 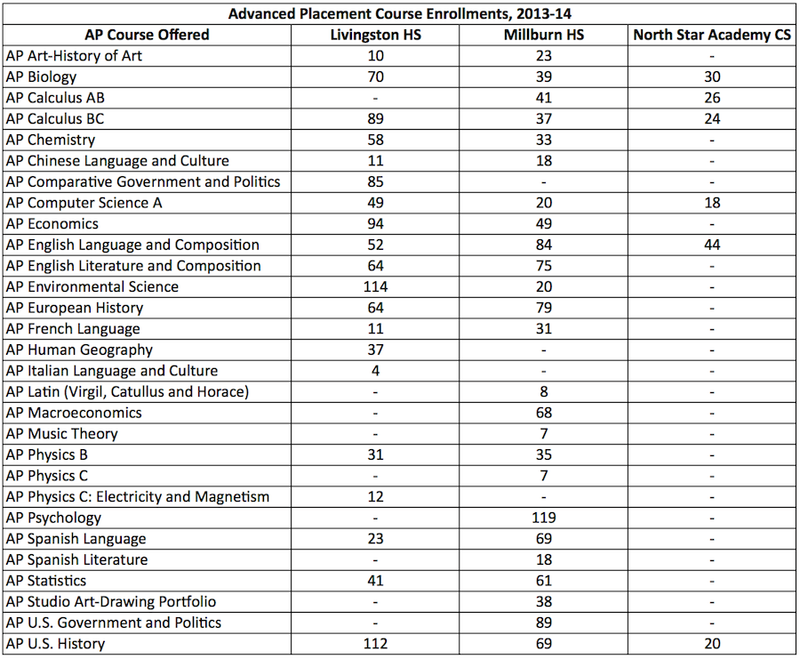 North Star has many more staff who are inexperienced compared to suburban schools. We know that teachers gain the most in effectiveness within their first few years of teaching; this is why the USDOE has made it a priority to address the unequal distribution of inexperienced teachers by race in America's schools. - North Star's students don't get equivalent scores on college entrance exams or AP tests, likely because suburban students have more access to college counseling, engage in test shopping, and access economic, social, and cultural capital not available to urban students. 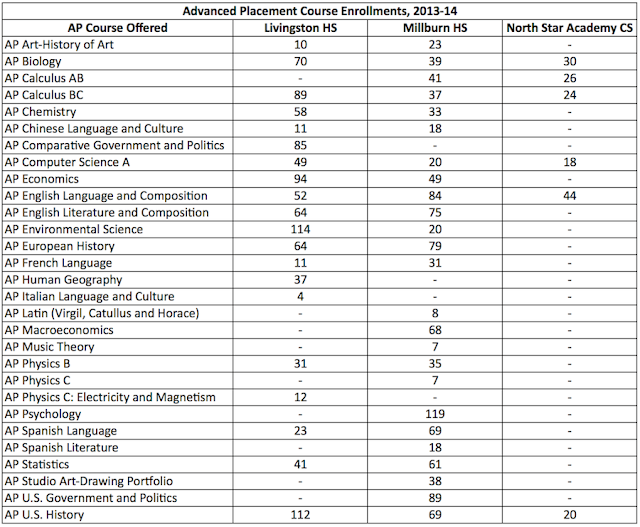 - North Star's students don't get nearly the breadth or depth of curricular offerings, particularly in AP courses. - North Star's students are far more likely to be suspended and spend more time in instructional settings, while less is spent on their extra-curricular offerings. - North Star's students don't have the same access to the same well-trained, experienced staff as suburban students. 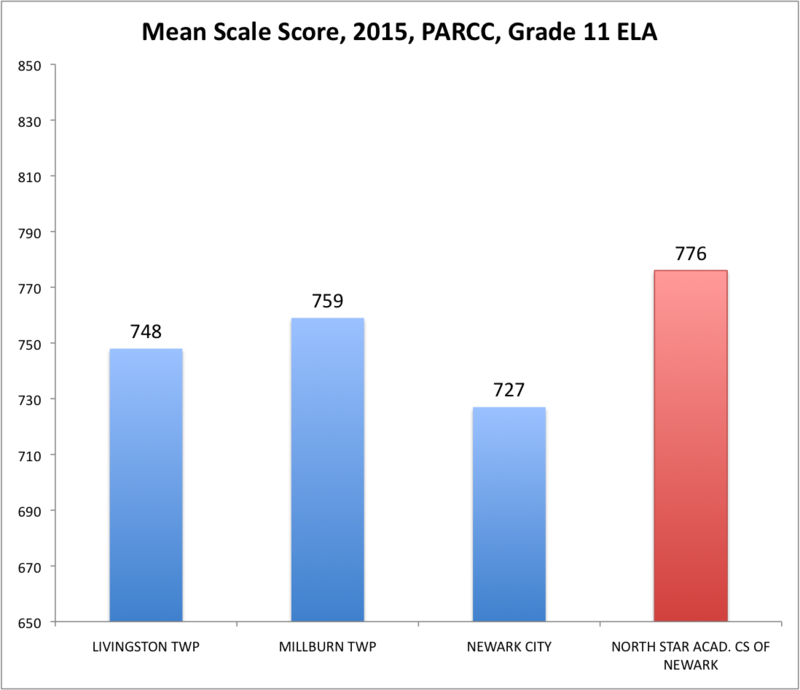 I'll be the first to say these inequities are also visited upon Newark's public, district students -- in fact, they are, in many cases, even worse. I don't pretend for a second that North Star's student population is at all equivalent to Millburn's or Livingston's in terms of the realities of their lives outside of school. I don't at all justify this inequality -- far from it. 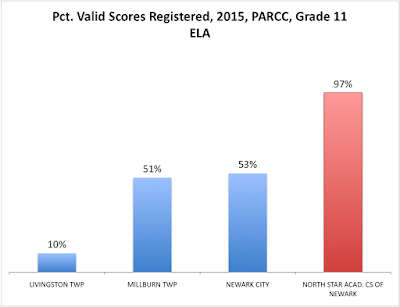 My point here is to show that even North Star's students, who are in much better school facilities than NPS students and who are less likely to be in the deepest level of economic disadvantage, are still not being given access to an education that compares to the schooling found in the affluent suburbs. Is this Uncommon's fault? Well, no... but yes. Because every time a charter school cheerleader implies that their school uses "systems and strategies" to "...giv[e] lie to the implication that school improvement needs to wait for the country to heal poverty," he is diverting us from acknowledging that school choice can't and won't solve the structural inequities that vex America's disadvantaged students. I'll wrap this up next time.